The report, titled “Naphtha Market - Global Industry Analysis, Size, Share, Growth, Trends and Forecast, 2013 - 2019”, is a detailed overview of the current state of the global naphtha market and a forecast of the market’s state over the period from 2013 to 2019.The report states that the global naphtha market will expand at a 5.1% CAGR over the report’s forecast period. This moderate yet positive growth will be the outcome of consistent demand from end-use industries such as plastic, transportation, and construction across the globe. At this growth pace, the market, which had a valuation of US$167.7 bn in 2012, will rise to US$ 237.6 bn by 2019. Volume-wise, the market is expected to expand at a 3.2% CAGR between 2013 and 2019. 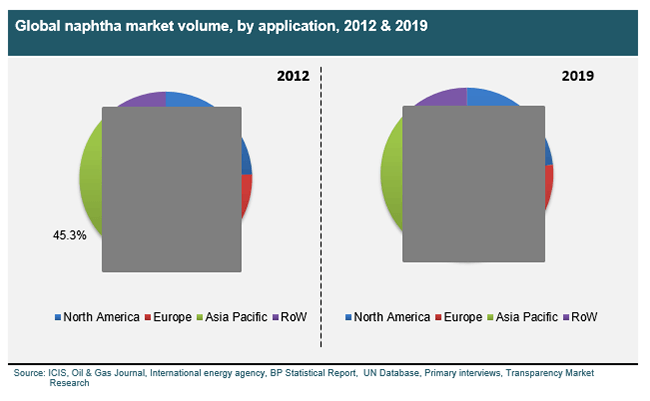 However, the market may face growth limiters owing to the volatile crude oil prices and the abundant availability of cheaper alternatives such as LPG and shale gas.Application-wise, the global naphtha market was dominated by the chemicals industry in 2012. Demand for naphtha from the global chemicals industry constituted 60% of the overall demand seen by the naphtha market in 2012. The petrochemical industry, which uses naphtha for the production of a variety of petrochemicals, is also a key end user of naphtha. The report states that the demand for naphtha, in terms of volume, is expected to expand at a 3.3% CAGR between 2013 and 2019 in the chemicals industry. Over the same timeframe, the market for naphtha is expected to expand at a 5.0% CAGR in the energy and fuel industry. In a number of other industries, naphtha is used for blending gasoline. Geography-wise, the global market for naphtha was led by the regional market of Asia Pacific, which accounted for a massive 40% market share in 2012. The high demand for naphtha in this region is the result of enormous construction and manufacturing activities as well as the rising demand for plastic in industries such as construction, automotives, and electronics. The North America regional market for naphtha is expected to expand at a moderate 2.6% CAGR, while the Europe market is expected to expand at a 2.1% CAGR over the report’s forecast period. The rising demand for naphtha from the oil and petrochemical industries in these regions will be the chief demand driver in these two regional segments of the global naphtha market, states the report. The competitive landscape of the global naphtha market features high fragmentation and consists of a vast number of small as well as medium-scale manufacturers. In this highly dynamic marketplace, distribution plays a critical role and is the key to overall success. Most of the key businesses operating in the global naphtha market rely on third party distributors for reaching to their consumers, and only a few big companies have their own distribution and marketing channels spread across the globe. Businesses such as Chevron, Shell, and BP are some of the key players in the market.